Although I’d heard of hot pots before picking up this cookbook, I honestly had little idea what they actually were. Which, is a good part of why this book attracted my attention. That and I love to cook – and eat – different kinds of food. Besides, get a load of that cover. Doesn’t it make you hungry just looking at it? So, what is a hot pot exactly? It’s a healthy, affordable meal that is also quick and easy to prepare. Starting with a steaming hot broth, you build upon it by adding proteins, vegetables, rice or noodles, sauce, and garnishes. A good-for-you dinner that will fill your belly and not break the bank at the same time. 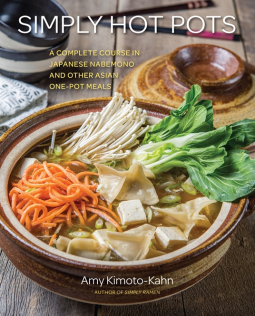 Simply Hot Pots covers all the bases giving you recipes for twelve different broths, a handful of sauces, and hot pots to fit every taste, diet, and need. There are plenty of meat-based, seafood-based, and vegetarian recipes to choose from as well as a special section for spicy hot pots in case that’s your jam. Truth be told, I love spicy stir fries, so I’m definitely all in with these spicy hot pots. This is an exceptionally comprehensive cookbook. You’re not only given a ton of recipes (including desserts!) and instructions on how to build the perfect hot pot, but you’re also blessed with a ton of additional information as well. There’s a list of traditional equipment as well as substitutions that you probably already have lurking in your cupboards. You get a glossary of ingredients plus more common replacements in case you’re unable to locate some of the more unique ingredients. In addition, the photos of the food – and the author’s family – are beautifully done, making you want to pull up a chair and grab your chopsticks. *Thanks to Netgalley, the publisher, and the author for a digital review copy in exchange for a fair and honest review. And now I’m definitely hungry. This cookbook sounds amazing. I really need to try a hot pot sometime. It had such a variety of recipes in it, something for everyone, really. And it was funny – I went to get Jimmy John’s for my older girl yesterday and never realized there was a ramen and hot pot place right next door.